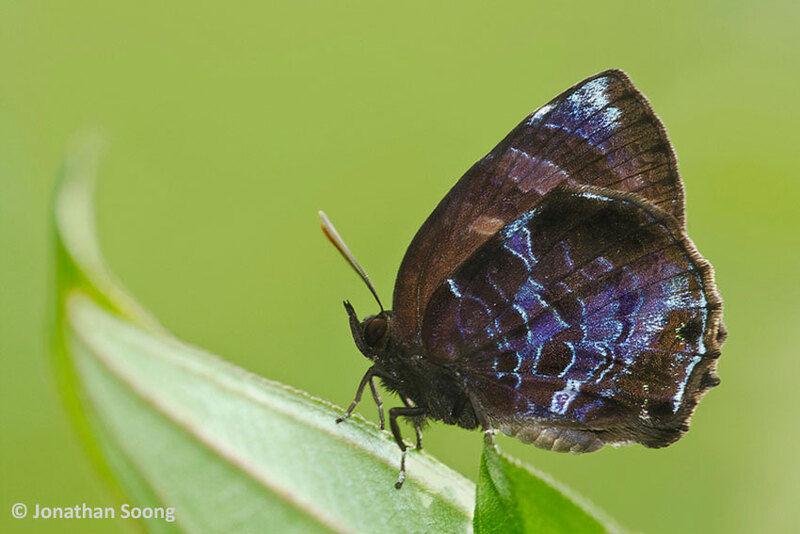 Of the four Flos species that occur in Singapore, the Darky Plushblue is the rarest. It is a forest-dependent species and rarely, if ever, seen outside the nature reserves in Singapore. It can be skittish and has a strong erratic flight if disturbed. Occasionally, it stops to feed at the ripened fruits of the Singapore Rhododendron (Melastoma malabathricum) where it may stay still for a better chance of a shot at it. The species is tailless, although the hindwing is toothed at veins 2 and 3. The upperside of the male is a lustrous violet-blue with a thin black border whilst the female is a deeper blue with a dark black border. On the underside, the purple brown markings are typical of the genus and the apical area of the forewing is whitened. This individual was photographed in the nature reserves by young ButterflyCircle member Jonathan Soong, a secondary school student in Singapore.